Spectral Products is offering the new SM304 TE cooled InGaAs array spectrometers. The SM304 series are ideal for NIR spectrometry that requires very high signal to noise ratio and/or high dynamic rang. The high performance with low-noise level of the SM304 series makes it possible to apply in very demanding applications. The good sensitivity of the detectors used in the SM304 series allows various broad-band applications like, measuring optical properties of various samples in NIR range, analyzing chemicals/moisture detection, as well as a narrow band applications like NIR laser characterization. 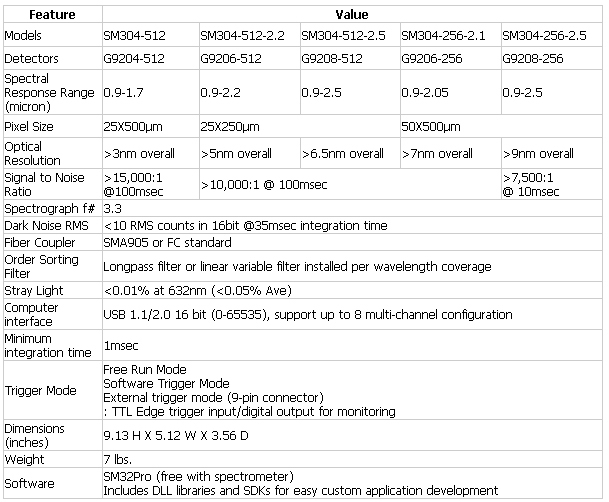 Standard interface to the SM304 series is a USB 1.1/2.0 compatible interface with 16-bit. Software support includes a SDK and DLLs for dedicated applications development and our SM32Pro Windows-based spectral acquisition and analysis software.